You've got no training budget. The old-timers in your organization are taking early-retirement packages. You know the basics, but feel like there's no one to teach you all the nuances of the trade. Have you considered turning to an unconventional mentor? Maybe the Internet? It sure worked for Danny Faught. Read all about how the Internet changed his career—-for the better. Turn to The Last Word, where software professionals who care about quality give you their opinion on hot topics. This month, find out why Carol Dekkers thinks watching children at play can teach you quite a bit about teamwork. Need a place to go to get the solutions you’ve been raving? Management Fix is what you’ve been looking for. In this issue, find out how to choose between two great candidates when you have only one open position. Get our technical editors’ take on everything that relates to the industry, technically speaking. In this issue, Esther Derby says farewell, but as she goes, she leaves some parting tips on writing. Test design, FUN? Hans Buwalda thinks so. His approach will infuse your testing with creativity and drama. Careful, you might get hooked! The project that was going to jump-start your career is sinking fast: The product is behind schedule, over budget, and riddled with bugs. Your “ship” is taking on water, and your team is threatening mutiny. How did you get into this mess? And how will you get out? 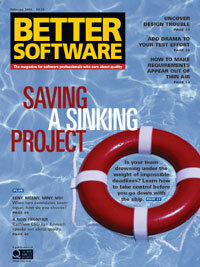 Peter Clark shows you how to navigate the waters of project management.